Outcast Regina Shen is forced by the World Federation to live on the seaward side of barrier walls built to hold back rising seas caused by abrupt climate change. A hurricane threatens to destroy what’s left of her world, tearing Regina from her family. Federation agents believe she has unique DNA that could stop human extinction. Not trusting them, Regina fights to stay alive and avoid capture while hunting for her family. hurricane. That evolved into what caused her circumstances to be so dire. The idea of abrupt climate change had been rattling around my head. It made sense to explore how this might have led to her situation. That led to the creation of barrier walls to hold back rising seas and to the Federation tossing those who didn’t conform over the wall to suffer and die. But Regina’s mother didn’t die and neither did Regina, until she now faces the joint threat of a hurricane and Federation agents. 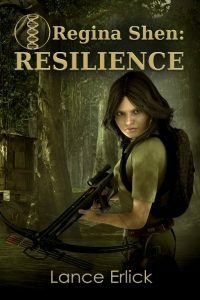 The Regina Shen series began with a resilient young woman, an outcast in the midst of a hurricane that took her home and family. From that came the question of why she was an outcast—she was born to a woman who had been thrown over the barrier wall into the swamps. Thus, Regina was an outcast through no fault of her own; she was suffering the guilt of her mother. One of Regina’s most prized discoveries was illegal print books from before the Federation. The story begins with Regina as the lowest of the low in her world. When the World Federation discovers that her DNA has unique properties, they pursue her and she faces the double jeopardy of the hurricane and Federation agents. Each layer added more challenges for Regina to overcome and to demonstrate that her tough upbringing and skills had uniquely equipped her to survive and rise above her adversities. With the sun fading behind trees on the west side of the island, we headed down the steps. I led the way beside the log stilts that held up the schoolhouse. We reached my hollowed-out log-boat beneath the window to Mo-Mere’s classroom. “Why can’t you be like the other girls?” Colleen asked when we reached the shore. I shrugged and untied the mooring rope. We can’t change our nature. Two gray-coated Antiquities agents entered the clearing in front of the school. They were the bogeybeasts we had nightmares about. Yet this was the first time I’d seen them at the school. Mo-Mere’s black flies. I helped Colleen into the boat and tossed the rope inside. I shooed a couple of rats that tried to hitch a ride and gave Colleen our Antiquities signal. She huddled low, clutching her turquoise necklace, a gift from Mom. I pushed the boat and slid into the back. Colleen pointed to an alligator surfacing among the cattails and tucked in her arms, making herself small. I couldn’t blame her. Last week she’d stumbled upon one of her classmates. Well, what was left of her after a gator caught her skipping class. She’d sneaked around the east side of the island, far from the schoolrooms, and found a hidden cove in which to soak her feet. Her legs were gone. Mo-Mere couldn’t save her. Colleen still bore the terror. When the gray-coats weren’t looking, I paddled out onto the muddy channel. Water extended in all directions, dotted with drenched trees, cattails, rush, and other swamp grasses. Small islands rose above the murky waters. Bigger islands to the west belonged to the “better class” of Marginals: the ones who succeeded at bartering salvage goods from sunken Richmond, and bounty hunters who collected girls to sell to Federation farms and mines. The Department of Antiquities not only squashed any history the Community Movement didn’t like and anything that smacked of rebellion, but they also hated scavengers who raided island settlements, and diving salvagers like Mom and me. That included most Marginals who struggled to survive in these swamps. I understood why Antiquities would destroy my family and Mo-Mere if they learned about the books we’d salvaged, but what did they have to fear from dishes and steel pots? Seeing Antiquities agents at school made me cautious. I steered close to shore, watching for alligators, snakes, and the spare coyote that somehow survived out here. They all made a decent feast, if they didn’t eat you first. I’d read that before the Great Collapse, gators had been a shy species, less than a dozen feet long, avoiding humans unless disturbed. To punish us, the Federation introduced crocodile DNA to create larger, more aggressive gators. I paddled across a channel and hugged the shore of the next island. “Got you, you little swamp rat,” said a terse voice behind me. Something pinched my neck. My sister stifled a scream and turned to jump overboard. The broad snout of an alligator poked above the water. Colleen dropped back into the log-boat and curled into a ball. I couldn’t move my arms or legs. The paddle fell from my grip and landed at my feet. I couldn’t feel anything below my neck. I stared at the charcoal sky, which grew darker by the minute. I’d heard of bounty hunters using nerve block when they captured girls, but I never expected to feel it myself. Someone pulled our boat through the cattails along the shore. She had a clump of ebony hair surrounding a coarse, pockmarked face, and wore the Department of Antiquities emblem on her gray uniform. In fact, she had the insignia of the chief inspector. “New regulations.” The coarse-faced one pinched my sister’s arm and jabbed a huge needle into the puckered skin. Colleen slumped like a dead squirrel, her head cocked to the side. She whimpered. “Then what’s the fuss?” She grabbed my left arm, pinched my skin, and stuck me with her needle. “A tracking implant, so we can find you later. The nerve block will fade. Then you can be on your way.” She drew blood, slapped a bandage over the open sores, and dropped me into my boat. I fell backward and saw two other gray uniforms. One held a tranquilizer rifle; that must have been what first pinched me. Coarse-face drew blood from Colleen and put a bandage on her oozing arm. Then the chief inspector joined the other women in an Antiquities speedboat.